Scottish Athletics insists the sport is showing signs of a legacy from the London Olympics and last year's Commonwealth Games in Glasgow. The governing body is delighted with a massive increase in the number of athletes entering this year's Age Group Championships. Four years ago, 600 took part at the Under 13, 15, 17 and 20 level event. 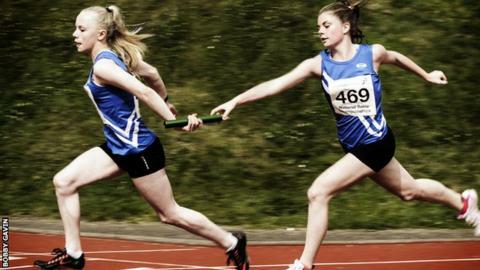 For the Grangemouth meeting on 23 and 24 August, 1289 young athletes will compete - a rise of 114% from 2011. Chief executive of Scottishathletics Nigel Holl said: "The entry numbers for our Age Group Champs are - quite simply - stunning. ''The numbers emphatically dispels any suggestion that legacy isn't happening in athletics north of the border. "Whilst others may question the impact of those Games [London and Glasgow] in terms of activity levels, I know that the catalytic impact they had within athletics in Scotland had and continues to have a most significant effect.